What do you do with a classroom full of early elementary students? You read to them and make art with them and send them home happy. For our first class of Story Book Art we made children’s art smocks so that we could send our students home to happy mammas because they had a handful of art and clean clothes. There are two types of moms who enroll their child in art class at a co-op. 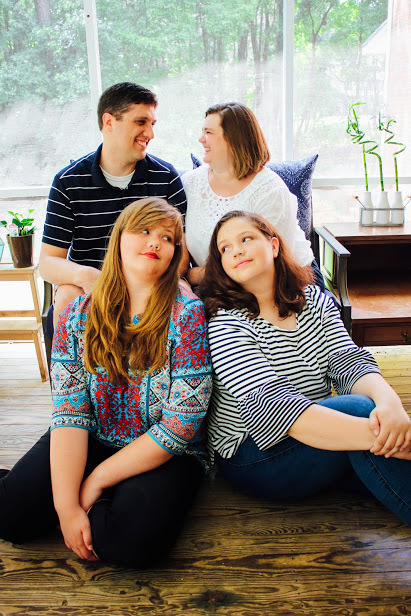 The first kind loves art and projects and wants their creative child to do more projects than they can provide. The second kind is the majority and those are the moms that want their kid to do some art, make some projects, have some fun and make the mess anywhere but their house. These are the kids that are often unsure and unskilled and on that first day, I wanted to boost their confidence and set the tone for enjoying art and embracing our work. I also believe in setting expectations for behavior high in the first class. I gave my speech about listening carefully, waiting well and obeying. After that it was time to set the expectation for our creations. I could not find a copy of The Beautiful Oops! But I found this video at the bottom of the amazon page and we watched it together before we started our craft on the first day. 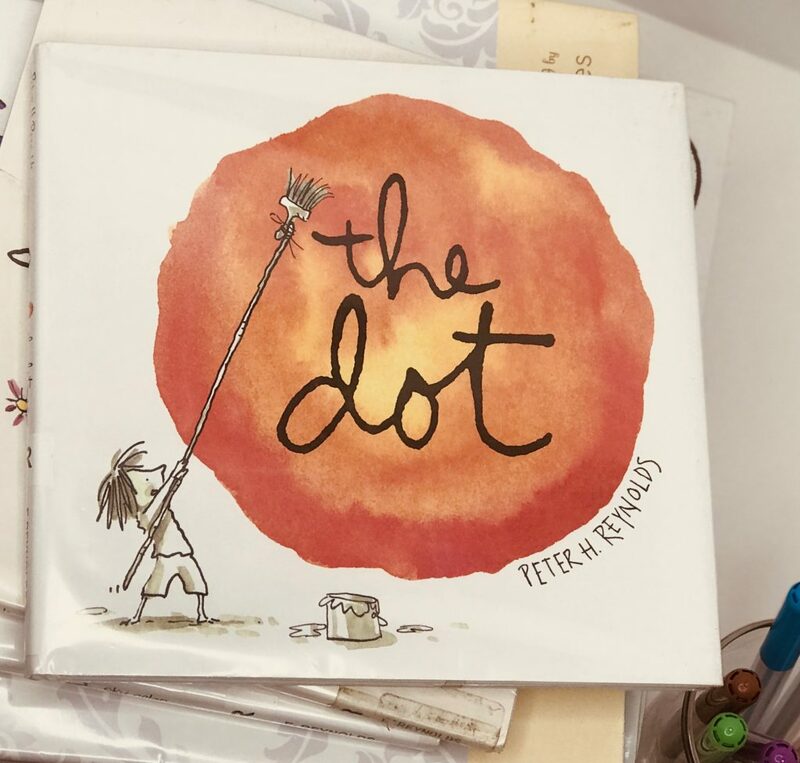 It turned out to be a great way to start the class and I had time to read a story book about a dot. I love Peter H Reynolds and his books on creativity and this one is probably my favorite. 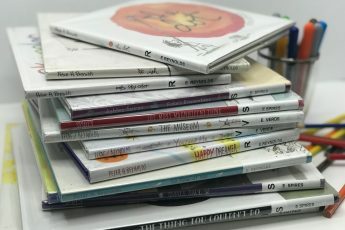 You can see my list of Books for Creative Kids here, if you want to keep looking for more options. When I read a book to children, I like to look for moments of tension and repetition and call their attention to it. It is so easy to see foreshadowing and conflict in story books. Finding it here and being trained to look for it in simple stories will set students up for success as they grow as readers. This is a skill you need as you read increasingly harder stories, so why not start teaching your students now. Our first day project was straight from Pinterest. We made smocks from adult men’s t-shirts. 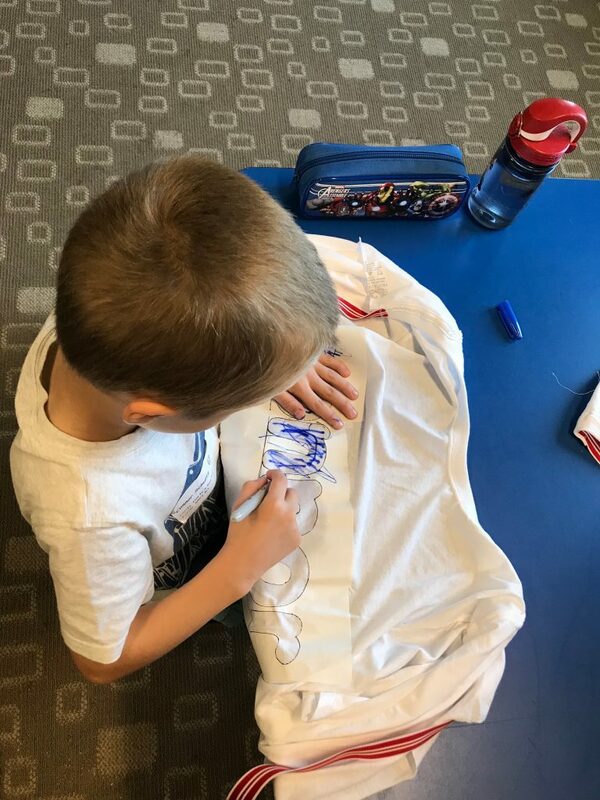 The students were so proud to put that smock on at the beginning of each class and thrilled to take them home on the last day. 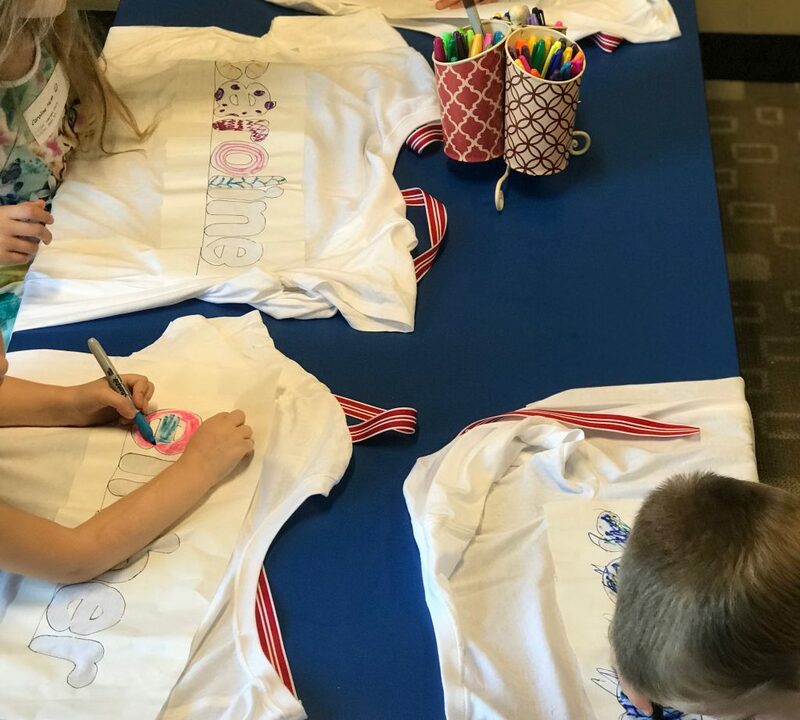 Here are all the step by step details on how to make personalized Children’s art smocks. Make one cut up the back of each men’s shirt so that your students can put their smock on easily over their clothes. I stitched a ribbon at the top of each shirt to make it easy to close. You could put in a plastic snap like to ones on this lip balm charm project, if you have a snap tool. 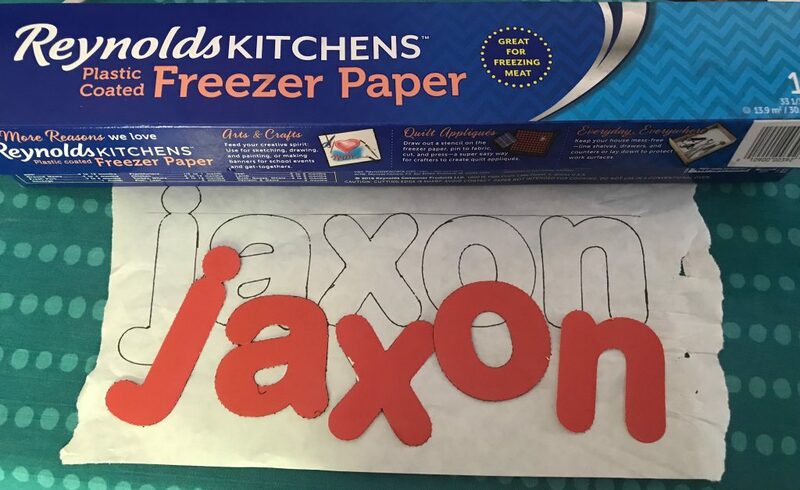 Use the punch-out letters to spell out the name and trace those letters on the non-shiny side of the freezer paper. The shiny side is the side that gets ironed on to the t-shirt. You could also use a Circuit or Silhouette to cut these stencils. I did not, because believe it or not this was actually faster than getting my machine set up and I was not sure if the freezer paper would be easy to get off the sticky mat. Cut each letter out so that the name comes out like a stencil and each letter is negative space with intact wax paper all around it. Iron the name stencil. Make sure it is shiny side down. Here is a video on how to iron the freezer paper. 1. Press the t-shirt to make sure it is smooth. 2. Iron the shiny side down to the shirt. 3. 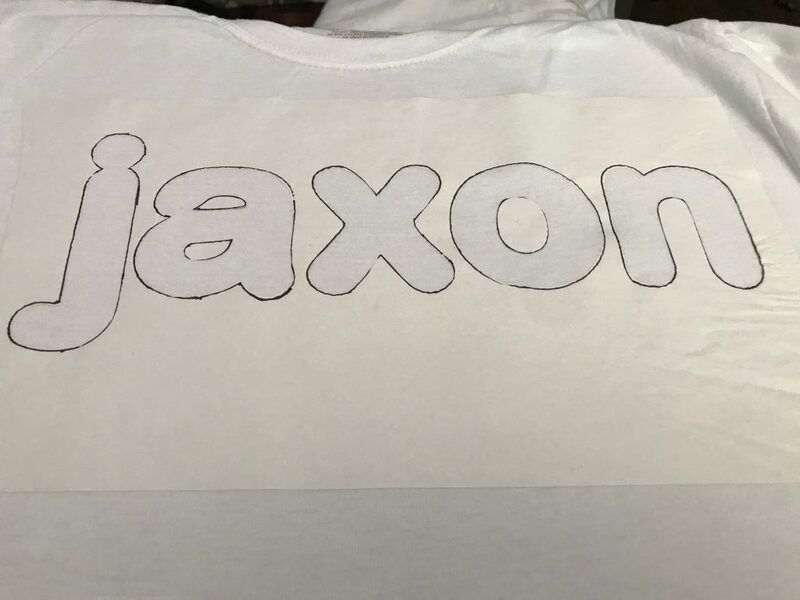 You want all the inside pieces of each letter placed and ironed in place. Get the sharpies and start coloring. Make sure to tell your students not to remove the stencil without your ok.
After the coloring you can remove the stencil. But make sure that each letter is clearly defined. On Calvin’s shirt I had to go over the outline of each letter with a black sharpie to make sure that the L did not just read like a zig-zag line. It would have been just a series of patterns if I had not traced over it and that is why you want to inspect each one before you remove the paper. 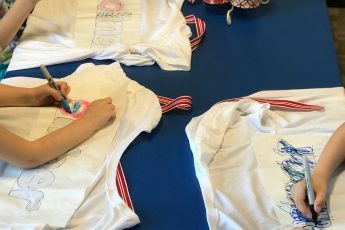 We had so much fun with this project and the art smocks made great name tags for the first few classes and wonderful gifts to take home when class was over. I would love to know if you are the mom who signs their kids up for art class because you want them to do more art projects than you can do at home or you are just thrilled that they get to finally do some art and you get to keep the mess out of your house. Please comment below and let me know!